In large bowl, combine sugar and butter; beat until light and fluffy. Add egg; beat well. Add flour and cinnamon; blend well. Cover dough with plastic wrap; refrigerate 1 hour for easier handling. Heat oven to 350°F. 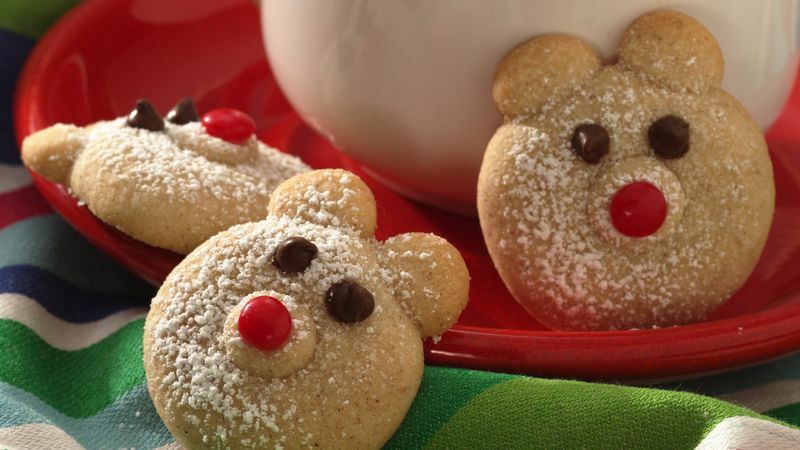 For each cookie, shape dough into 1-inch ball; place 2 inches apart on ungreased cookie sheets. Flatten slightly. Shape dough into 3 (1/4-inch) balls. Place 2 of the balls above and touching larger ball for ears and 1 ball on top to resemble snout. Flatten slightly. Bake at 350°F. for 11 to 15 minutes or until firm to the touch. Immediately remove from cookie sheets. Lightly sprinkle cookies with powdered sugar. Press 2 chocolate chips into each cookie for eyes and 1 cinnamon candy for nose.